I turned Jessie's Sketch at Crazy 4 Challenges on it's side because it fit my motorcycle perfectly. My Sons ride with Soldiers For Jesus and they have given me a very adventurous few years so this card will be going to them. Supplies: Black Card Blank 5" X 6 1/2" Halcraft, Papers: Stampin Up-Whisper White, Basic Grey, silver unknown, Stamps: Stampin Up-Motorcycle, sentiment created in PrintMaster 11, Ink: Ranger Archival Ink-Jet Black, VersaMark Ink, Stampin Up clear embossing powder, Sharpie poster paint pen-silver, Fiskars shape cutter template-Ovals-1, Bazzill-tiny brads, The Paper Studio Spare Parts-silver round brads, Stampin Up-Hodgepodge Hardware, Cuttlebug embossing folder-Diamond Plate, pop dots. Love the bike! Thanks for playing with Speedy's Friends!! Thank YOU for joining us during this grateful challenge. Speedy the Cat thanks you too! What a great masculine card! 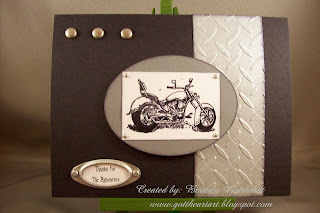 love the embossed panel - perfect for the bike stamp! thanks for playing with Speedy this week! Love your clean, and mean, and powerful machine. Great card and so glad you played along with Speedy's Friends this week.